Game 1: Cross spawn on FS. Snow opened with a gateway expand against the hatch first of Killer. Some early zealot pressure did minor damage. Snow decided to go for his trademark unit, reavers. With sair/reaver, he dropped Killer's main and managed to just snipe the spire with the zealots while the reaver had several drone kills. Snow ended up harassing some more with the reaver at the natural then attacked with a speed zealot army with 2 reavers for support. This was too much for Killer's hydras to handle promoting the gg. Game 2: Spawning close positions (1 and 5) on CB, Snow went for forge FE while Killer opted for pool first. Not much harass occurred as Snow decided to go for 2 stargate sair vs 3 hatch spire. Lots of overlords were killed early on supply blocking Killer. A small zealot army also ran into Killer's main as Snow took a hidden 3rd which was scouted. Snow would lose it only to take the mineral only expansion as its replacement. Killer eventually took a 4th and though down in upgrades (0/0 to 2/0), managed to barely defend against the constant attacks from Snow (pic). Snow grabbed a 4th then went for a massive attack on Killer's natural. Killer held, double expanded then went into aggression mode when defilers were out. With some dark swarms, the 4th of Snow was taken out. Snow re-established a 4th at the 12 o'clock position and re-took the previous 4th to go up to 5 bases however with constant attacks from Killer, he couldn't hold his 4th anymore. Another big battle took place at Killer's mineral only expansion though with plagues and a ton of units streaming from Killer's other bases, it's cleaned up with Snow calling the gg. Game 3: Both players went with a similar start to game 2 with a pool first from Killer and a forge FE from Snow. Some probes were pulled off to hold off the zerglings while the cannons warped in. Killer saw the expansion, grabbed a third and got a hydra den. The probe was prevented from scouting until it was too late. Snow puts up lots of cannons waiting for the attack however once Killer reached a critical mass, he moved in, target fired the cannons and won the game to go up 2-1. Game 4: Snow opened with forge FE to Killer's expansion first build. Killer quickly took his inbase hatchery going up to three bases. Both players were pretty passive when Snow took his own inbase expansion while going for sair/reaver. Killer took his fourth soon after. Before disruption web was finished, Killer defended well however it became much harder late on. Snow went for Killer's 4th (3 o'clock) causing massive damage before losing his reavers . The aggression wouldn't stop as Snow dropped Killer's newly established 5th then his 4th again taking it down before going for his newly established 6th (12 o'clock) and took that down too as he transitioned to 5 stargate carrier. He would even get Killer's 3rd and cause massive casualties in his main as well (pic). Killer decided to counter by taking down Snow's 4th but not before losing most of his hydra army. Once Snow reached critical carrier/corsair numbers, he would go around in a counterclockwise fashion starting from about 5 o'clock killing Killer's base before reaching his natural to tie the series 2-2. Game 5: 1 gate expand against early pool into expansion from Killer. Killer managed to get some zerglings inside Snow's base and kept him busy as he took a third. After the zerglings ran out, Snow transitioned to sair/reaver while Killer went for hydras but it got scouted by a probe. Once scouted, Snow went mass cannons while Killer decided to kill his forge/gate/pylon before retreating. Snow became aggressive with his first reaver though Killer's defense was impeccable losing only a single hydra. This wouldn't stay the case though as Snow found a weakness in Killer's third and managed to net himself some drone/hydra kills using 2 zealots+a reaver. Soon after, he would go on the offensive again with about a control group of zealots+1 reaver but Killer was more than prepared as he wiped it all out. Seeing an opportunity, Killer went on the offensive. He attacked Snow's 3rd with mass hydras from 2 sides and managed to take it down after he went for a mutalisk switch that caught Snow offguard. At this point, Killer took a 4th then a 5th soon after as he continued with mass hydras and came knocking at Snow's natural. Snow barely held on and countered at Killer's third but his little army was wiped out. Snow gg'd and Killer took the series 3-2! Game 2: It was now Mind's turn to try his hand at a forward rax. Both players opened rax though Sea skipped his first marine going for a faster fac and then cc which got denied by the 2 marines. Some vulture wars took place and Sea's cc was delayed several times. Eventually, he managed to get it up though Mind went up to 3 fac, researched mines and ended up hitting right before the first 2 tanks of Sea taking out some workers, mining his expansion and forcing Sea to gg out. Game 3: Both players opened with a similar build, 1 rax fac into cc except Sea skipped his first vulture for a faster machine shop. Both went up to 2 fac with machine shops though Mind eventually added 2 more factories to Sea's 1 fac addition. With the middle of the map established as no man's land, Sea took the bottom right corner as his third and left his narrow choke undefended. Mind seized the opportunity, sieged Sea's expansion close to the choke and with Sea unable to break it, Mind went on to win the game and go up 2-1. Game 4: Both opened up with the same build again getting their first marine, first vulture before machine shop then getting the cc at the expansion though Sea's was slightly faster. They both went up to 2 fac and went for mass vultures as well. Things diverted though as Sea added another fac and starport while Mind went for 2 more fac going up to 4 fac (eventually 5 fac). Mind tried to break Sea's expansion with mass vultures+mines but Sea managed to hold on and went for his inbase expansion for his third. Mind tried to block the NW exit out of Sea's base but couldn't and had to retreat. At this point, Sea showed his prowess as he managed to win a big engagement and use its momentum to push all the way to the bridge outside Mind's natural. Sea expanded behind this going up to 4 bases and a 5th base followed soon after. With Mind dedicating most of his army for defending his natural, Sea caught him off guard as he went for an attack on his third base causing massive eco damage and cutting down his army (pic). With that, he grabbed a 6th and kept up the pressure on Mind to tie the series 2-2. You don't mess with Sea! Game 5: With everything on the line, it all came down to Game 5. With close spawns on FS, Mind decided it was time to finish this off with a 2 fac. Sea decided to go for 1 fac expand getting the cc in his main. A couple of vultures managed to lay down some mines and with a mine drag, many SCVs were lost (pic) however Sea retained his tanks and with another tank+vulture went on the offensive. Using mines, he managed to isolate a tank and a vulture from Mind's army. With several more vultures joining the fight for Sea, he laid down mines, took many SCVs down and was up a tank when Mind gg'd out giving him the series. Sea moves on to the Ro8! Game 1: Both players went for pool first with gas for speedlings. After pool was finished, both made zerglings and engaged in zergling combat which hero won. hero ended up getting the fast lair. More zergling engagements took place as Larva tried to break into hero's base but was stopped. hero had the first mutalisks out and went around hunting overlords supply blocking Larva. 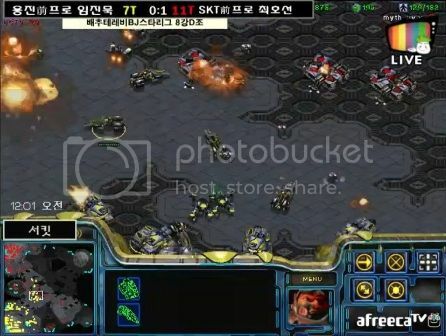 With Larva having to spend money on overlords, his mutalisk count was less than hero's who ended up attacking Larva, killed his mutalisks and took game 1. Game 2: hero opened with pool first to Larva's expansion first. hero would end up expanding as well with both players getting their lair and spire at around the same time. Anticipating a zergling attack based on how much zergling Larva pumped out, hero made a sunken. 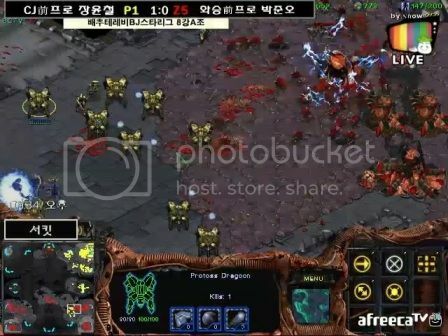 Larva saw an opening and tried to run his zerglings into the main but was stopped by some zerglings at the top (pic). hero barely held on though a small zergling followup attack saw him lose 2 drones. With mutalisks out, hero managed to get his count higher than Larva and with some scourge, attacked Larva's mutalisks wiping them out to go up 2-0. Game 3: In the shortest game in the Ro8, Larva went for a 9 pool while hero decided to expand first. This proved to be his undoing as Larva kept pumping zerglings and rallying them to his base. It looked like hero would hold with a sunken morphing however Larva managed to surround it and took it down. With his zerglings dying as they spawned and no chance of surviving, hero gg'd out. Game 4: Both players opened pool first and expanded soon after. 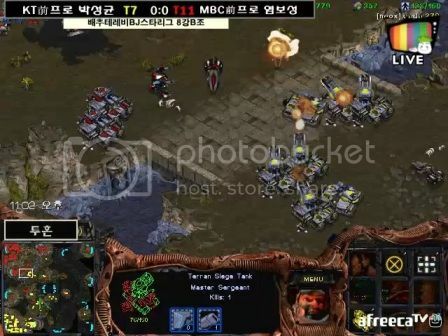 hero would go on to make mass zerglings and attack larva's expansion. Upon scouting them moving on, Larva made some of his own and with some great positioning, came out on top. As this battle raged on, both players were getting their spires. 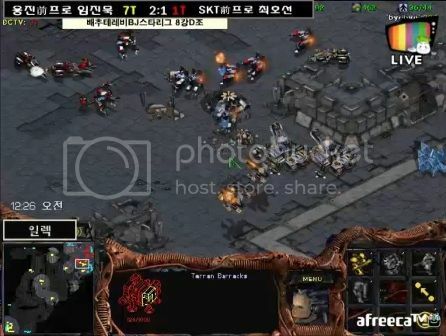 Larva tried a counter attack with his zerglings several times but hero held on. With mutalisks out for both players, the battle took to the air. With great micro, hero managed to take out many scourge and eliminate Larva's mutalisks. His followup zergling attack caused Larva to gg with Hero taking the series 3-1 to advance to the Ro8! Game 1: PianO went fac expand to sSak's 1 rax FE. sSak added a fac soon after expanding and went for a starport. Using his SCV to scout, sSak realized that PianO was preparing for an attack so he made some extra bunkers to defend and buy time. Right after PianO killed the first 2 bunkers and moved into the natural, a tank from the high ground+another from the low ground with SCVs acting as buffers helped sSak defend. As this battle was ongoing, PianO went for 2 port wraith as a followup though it got scouted with a wraith from sSak. After defending the wraith followup from PianO, sSak moved on and scouted PianO going for his third. Using some SCVs to buffer, his large army of tanks+goliaths was more than enough to crush PianO's who tapped out after his natural got sieged. Game 2: PianO went 1 rax FE while sSak went for factory expand getting a vulture first before getting his machine shop. Anticipating a drop, PianO kept some units in his base and managed to catch it before it did any damage. With his small tank/goliath army, PianO moved out and attacked sSak's expansion. Workers had to be pulled but he managed to survive and would grab his third mineral only soon after. PianO tried to deny this but couldn't so he attacked into the expansion again but faced resistance leading to him withdrawing. After getting a sizable army, PianO tried yet again and managed to take down the third as he took his own. Seeing as a good portion of PianO's army was on the high ground near his ex-third base, sSak took the opportunity to try and contain PianO while taking the 9 o'clock base. PianO realized this, set up a large surround then went for the break (pic). He crushed sSak's army, took out his third while he established his own fourth. sSak managed to get up a third a bit later though PianO still had the higher base count. PianO tried to deny the newly established third of sSak but couldn't however he engaged sSak's army yet again near the high ground and crushed it. With his air superiority gone (some wraith vs valkyrie battle offscreen) and his army left in shambles, sSak gg'd giving PianO the game. Game 3: Both players opened with 1 rax fac though PianO got a cc soon after then got a machine shop, researched vulture speed and went mass vultures. sSak on the other hand, got a starport after fac before getting his cc. Once PianO had the first couple of vultures, he became really aggressive. He forced sSak to block his entrance to the main with his rax (since PianO's rax was also there) meaning SCVs couldn't escape so 4 vultures cleaned up. More vulture runbys into the main and some in the expansion kill more workers and mine the area causing 2 tanks to fall. When another group of vultures from PianO kill sSak's vultures, sSak gg'd out going down 1-2 in the series. Game 4: With this possibly being the last game, PianO wanted to finish with style. He went with a 1-1-1 proxying both factory and starport close to sSak. sSak ended up going for cc first leaving him quite vulnerable in the early game. Though sSak does manage to scout the fac and block his choke with the cc+bunker, it wasn't enough. After getting the first vulture, PianO added a machine shop to get tanks and research siege mode. sSak knew what was coming and went for 2 factories with no machine shops and added an armory. PianO end up finishing his first bunker for the contain then after breaking down sSak's bunker, moved in and secured the choke (pic). sSak was forced to engage however PianO's position was too good as he lost all his army+SCVs for a tank and two wraith. With that, he gg'd out and PianO won the game. PianO is headed to Ro8! No deception here, Sea has beaten Killer in all their SRT finals! Though that's all in the past, there is no doubt that Killer still remembers those losses. What also makes things worse for Killer is that he just lost the 41 Starleague finals to Mind, a Terran that has vZ on par or possibly worse than Sea's. Killer did beat a notable Terran player in PianO on his way to the semis so he's certainly capable of beating good Terrans however his record since January 2014 sits at 8-20 with losses to Mind, sSak, Mong, Sea and Shinee. His ZvT is his Achilles' heel and he needs more work on it to get it to the level of his other matchups. On the other hand, Sea's vZ record sits at 72% with a 14-5 record since January 2014. He's beaten all kinds of Zerg players such as Larva, ZerO, Terror, Modesty, beast etc... Like the Sea, his repertoire of builds seems rather infinite and he's not afraid to bust out a forward rax if he feels like it. He understands the matchup well and has good decision making skills which contribute to his success. Of course, Sea makes mistakes and pays for them. In his game against Cola in 41 Starleague Ro16, after failing his forward rax, he was knocked down to the loser's match because he couldn't hold on against Cola's muta micro. 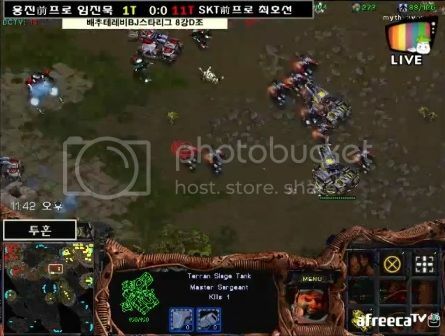 In his game against Terror in 2014 Gabangpop 1st Sonic Proleague, he lost the game after Terror decided to go for a zergling all in seeing that Sea's bunker wasn't completed yet. As much as I would love to say that Killer will take this, I have no choice but to take Sea's side. Killer is one strong Zerg player and I have no doubt that he'll be able to take some games however I just can't see Killer taking a series off Sea coming off his recent loss on top of all their history together. Prediction: Sea > Killer, wins 3-2. The other TvZ matchup is also between two players that are well known in the scene but lack the deep history that Sea and Killer have. Looking at stats alone, PianO has an 85% win rate with a sample size of 20 games. He's won against players such as Modesty, Kwanro, Killer, Cola and others. His wins against Modesty who is the best ZvTers in the current scene show that he's able to elevate his game to the next level if need be. He has really great multitasking and mechanics and isn't afraid to go to the late game where he shines the most. In addition to all this, he's beaten Modesty twice with a 2-0 score back in Ro32. In Ro16, PianO made an example of beast as he easily won the series 3-0 before going against all odds and dispatching sSak 3-1 in the Ro8. His TvZ is rock solid and he can also be very dedicated if rumours of his 14 hours a day practice when he first came to the Afreeca scene aren't exaggerated. His opponent is none other than hero, a player with a dominant vP but a lacking vZ. From a sample size of over 100 games, his current record stands at 48% with loses to sSak, Ample, Sea and others. hero made his way to the semis on the backbone of his Protoss and Zerg game. He's faced PianO once before in Gabangpop 1st Sonic Proleague where he beat him on Mist. Aside from that, both players have met on ladder before resulting in quite the thriller which hero took. With all these details, everything seems to be in PianO's favour. He plays the matchup well, has shown that he is able to compete and his record speaks volumes about his capabilities. However, hero isn't someone to be doubted either even if his vT can be shaky at times. He's played games before against capable Terrans and crushed them. If hero can come prepared with a variety of builds and manages to throw PianO off his game, he still has a chance seeing as he's beaten PianO before. With all that said, PianO is still the favourite to advance. Prediction: PianO > hero, wins 3-1.
Who do you think will advance? Will Killer be swept away or will he fight the currents? Will PianO easily beat hero or will hero be worthy of his name, a Zerg that shines when needed? Discuss! Hopefully, Sea > Killer since I think PianO and hero is really a toss up, maybe even hero favored. I disagree. hero's ZvT is his worst mu. I think PianO is pretty solid in the matchup so I can see him winning their series. Same goes for Sea. His ZvT is one of the best on afreeca and he's winning head to head (I believe) against Killer so it wouldn't surprise me if we have a TvT finals (please TvZ! lol). Hell, even Killer beat him on his stream just recently. I understand PianO's record vs Modesty is stellar, but it's more of case with PianO's having Modesty's number rather than an accurate representation of his current TvZ. 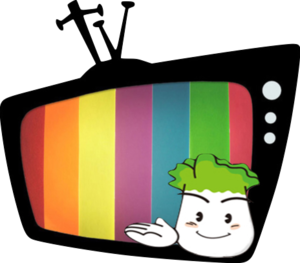 Don't get me wrong, I'm rooting for PianO to win the whole thing because it gives hope that post-army players can still compete in the SoSPA era and I do believe TvZ is PianO's best match-up. If you asked me a month ago who wins between PianO and hero, I would have said PianO no questions ask. 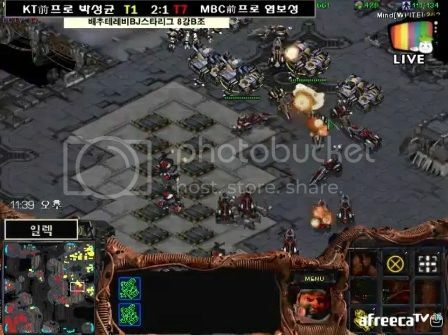 But considering that hero is learning from Modesty's theories on ZvT, even go as far as doing the Modesty Build against PianO 1st game in that LoveTV showmatch, shows that hero's approach to the match-up has changed and he's willing to start mixing it up against PianO. Same with Sea vs Killer, although I still think Sea wins vs Killer in the semis based on past results of their notorious SoSPA rivalry. However, if you watched the recent Sonic Super Fights, Sea went 3-2 against larva of all people!, 3-2 against hero, and 3-1 against ZerO! Both the semi matches aren't as skewed as they seems, and I believe any of these four players can make it to the finals with Sea vs Killer being Sea favored. yes, it might not be crazy skewed and its true that the Zergs have taken games (and series at times) off the Terrans as well however I think all the Terrans have the advantage here. The matchup has been historically Terran favoured as well. Heck, Mong eliminated Killer in the Ro32 back in SSL9 and though that's far back, I've always seen Killer as a higher level player than Mong (not to take anything from Mong) so that was definitely a shocker. I think you're underestimating Larva. I used to have the same mindset when it came to him but his ZvP and ZvT are prett decent. He's taken down some pretty big names though his ZvZ needs work. My point? Terrans still have the advantage here and there is a chance of a TvT final. Everyone and their mothers knew Killer was slumping at the time with his girlfriend (and that SSL9 Ro32 Group A matches were close), so I would not count results 6 months ago as evidence. Hopefully with SSL10 and LSL3, Killer would actually start focusing now. And Mong and HiyA were doing very well at that time too, whereas now they are clearly not part of the top 4 Terrans right now. I don't think the real point here is T>Z or "Terran still have the advantage here", I think it more of a case of Sea being favored against Killer and hero having a very slight advantage against PianO. Although I do hope for a TvT finals, despite it seems slightly more likely to be a TvZ finals, based on the most recent results (historical %s don't interest me since metagames shift and players improve/slump overtime). TvZ, ZvP, and PvT are all balanced enough and people should focus more on the better players and better plays to better understand the match-ups more accurately. But you can't really deny that the matchup in TvZ has been historically terran favoured. I'm not saying Zerg players always lose or can't win in the early or mid game but I am saying that all terran players nowadays have great control which means that Zerg players should be careful in their engagement. Once it gets mid to late game, the matchup is pretty balanced but early game definitely favours Terran players, no doubt about it. There was a similar small discussion in BW General discussion which touches on this as well. Sea is favoured against Killer I agree but I don't think hero has any advantage over PianO. imo they are both either close or PianO has a slight advantage. Historical %s depend on what you consider. Are you talking numbers from back in the day or recent numbers because recent numbers are a better indication of things in general though older records are a window into a player's possible potential if they ever get the same level of practice. I'd rather have TvZ finals but that's just me. Regardless of what we want, in the end, it all depends on how well the players play and what they bring to the battlefield. Semifinals Preview has been added! Yep PianO still got it, sorry hero fans but from watching quite a few of his zvts lately, including the ones where he beats PianO, yes, I don't see him standing a chance unless he gets super lucky or PianO chokes from the pressure. TvT finals plz. Well, assuming Sea plays as well as he used to. If not, then I'd settle for the TvZ.. This semifinal is gonna be so epic. I don't even care who goes to the finals. Great read, Bigfan, nice work. Love those animated gif's! What's the process for making one of those from a YT video?